In 79 AD, torrid volcanic ash and pumice raced down the slopes of Mount Vesuvius and smothered Pompeii to death. Since excavations began in the mid-18th century, the city has yielded a bounty of cultural treasures and insight into the life of the ancient world. 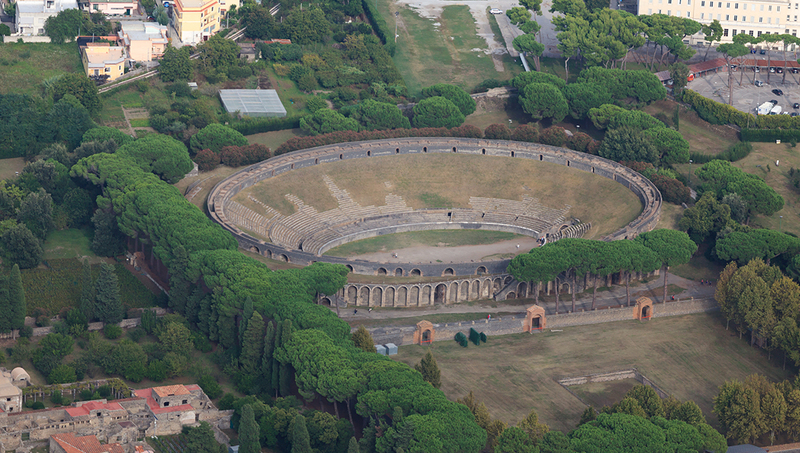 Built in 80 BC and considered the earliest of its kind in the world, this grand venue hosted gladiator games and seated up to 20,000 fans in three sections based on social class. Considered Pompeii's oldest religous building, a replica of the bronze statue of the god of prophecy stands poised, as if holding a bow and arrow, amid a row of Corinthian columns. 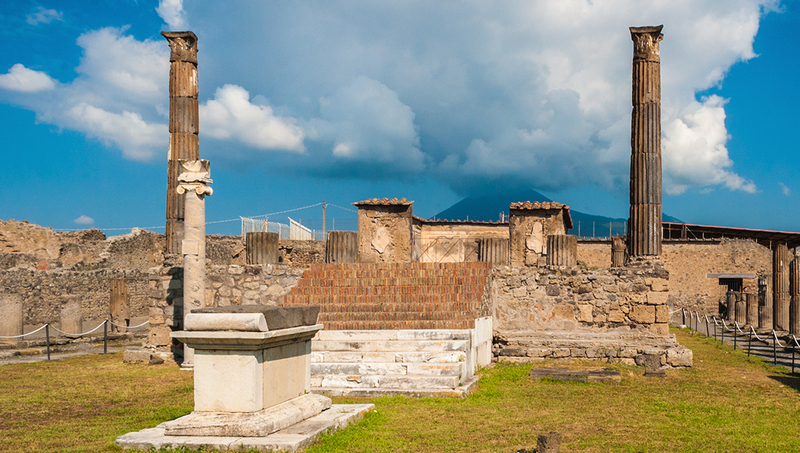 Mount Vesuvius looms in the background of the temple dedicated to the Capitoline Triad of Jupiter, Juno and Minerva. Romans revered Jupiter as the most supreme of their deities. It's one of the largest residences of Pompeii, housing the replica of the famed Alexander Mosaic, which depicts Alexander the Great battling Persian king Darius III. This opulent abode with frescoes and mosaics takes its name not from its original owners, the Poppaeus family, but from the striking fresco portraying the Greek poet Menander. After becoming freed slaves, the Vettii brothers spared no expense highlighting their nouveau-riche status, boasting exquisite frescoes and lustrous wall paintings. Nine painted scenes on the walls of the Initiation Chamber reflect a bride's ceremonial passage into womanhood and the cult of Dionysus, the Greek god of wine and fertility. 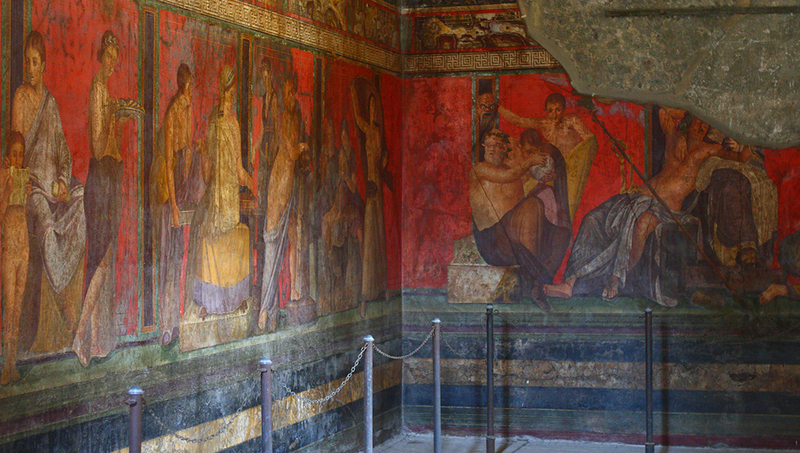 Admission into ancient Pompeii costs €11, but it's free on the first Sunday of the month. 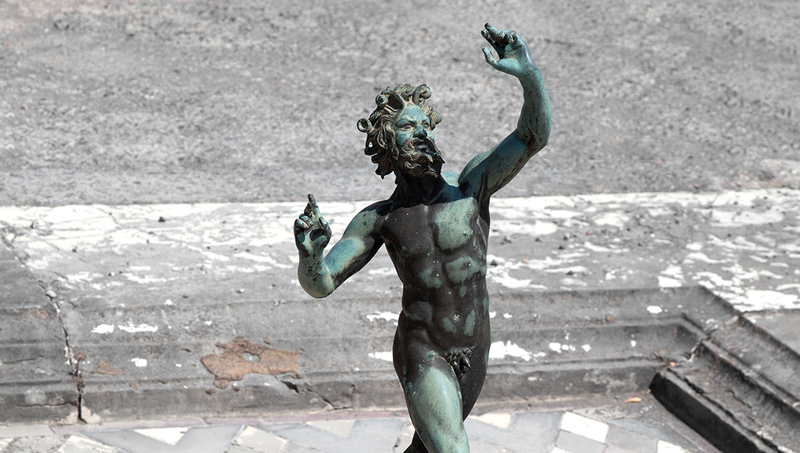 It's not necessary to purchase tickets in advance online, and you can enter at one of three entrances: Villa dei Misteri, Porta Marina and the Anfiteatro. For those who want to visit Pompeii, Herculaneum, Oplontis, Boscoreale and Stabia, a 3-day pass costs €20. Pompeii is open from April to October from 8:30 AM to 7:30 PM, and from 8:30 AM to 5:30 PM from November to March. The Circumvesuviana departs on the Naples-Sorrento train line every half hour and takes 30-40 minutes to arrive at Pompeii-Scavi - Villa dei Misteri station. The SITA bus operates Monday to Saturday only. It leaves from the Port of Naples and Naples Central Station and stops at Piazza Esedra in Pompeii (entrance to the site from here is at Porta Marina). If you're traveling by car, take the A3 highway (autostrada). In southern Italy, spring and fall offer pleasant temperatures, while summer is quite toasty. 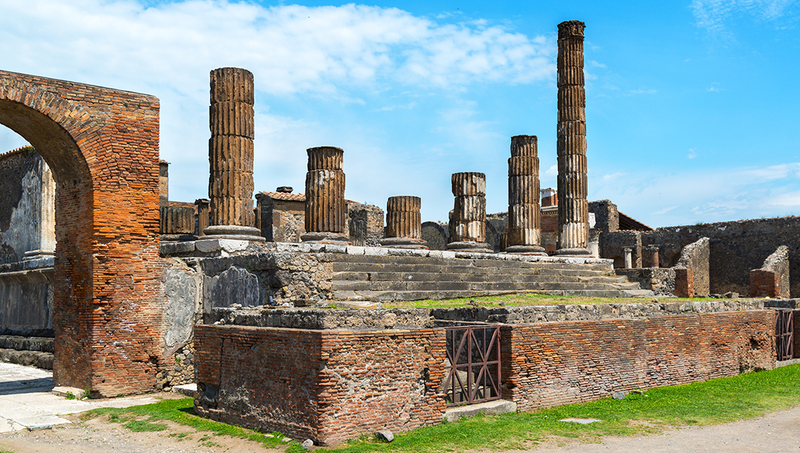 Pompeii isn't small in area, and you should expect to spend a minimum of 2-3 hours exploring. It's best to bring a bottle of water, and don't forget to wear proper shoes and sunblock. Open April to October, 8:30 AM to 7:30 PM and November to March, 8:30 AM to 5:30 PM. Adult admission starts at just €11 and continues upwards with tour and transportation options. This site offers so much history, having a guide definitely enriches your visit. Take the Circumvesuviana train to the Pompeii-Scavi-Villa dei Misteri station, or the SITA bus to the Piazza Esedra station. There is very little shade in this huge area, so make sure you bring a hat, sunscreen and plenty of water. Once inside, concessions are limited, so plan ahead and get food in advance if you need to. Excellent - a great overview of Pompeii with ease and comfort! Superb tour of Pompeii - we had a fella names Paulo ... the "Indiana Jones of Pompeii". We were the perfectly sized group ... 14 people of which we were six. Our group ranged from 10 thru 86 and the tour was at a terrific pace and just enough to understand the life of Pompeii 2000 years ago. We could easily interact with Paulo (our guide) and dictate the style and areas we wanted to explore further ... he was so accommodating! This was the highlight of our trip to Italy ... thank you Paulo! We will return again and find you out for a personal tour! A fantastic service from start to finish, with lovely wines to Savour! Our guide (Sabrina) was very friendly and knowledgeable and the driver (Lino) was very professional. We visited Sorrento (which was not listed in the tour description, so we got it as a gratuity, thank you Sabrina and Lino), Positano, Amalfi, and Ravello. The lunch was decent and in a nice restaurant in Conca dei Marini with a beautiful view over the coastline. We had approximately 50 min per location for the visit so use your time wisely because it is running out very fast! Be prepared that you will spend half of the tour in the bus but then I cannot think of a better way to experience the Amalfi coast in such a short time. A small tip - if possible, sit on the right side of the bus and enjoy the ride (the views are much more rewarding compared to the left side). Absolutely amazing and well recommended! He brought Pompeii to life again for us and entertained us every step of the way, helping us imagine what life was like before 79AD. Despite the rain, we enjoyed every single moment and could not believe 2.5 hours had passed so quickly without realising it. Worth every penny! Keep it up!